With less than two weeks to go before the election, 46% of registered voters favor Hillary Clinton or lean toward Clinton, while 40% support Trump or lean toward Trump; 6% back Libertarian Gary Johnson, while 3% support Green Party nominee Jill Stein. Increasingly, Clinton supporters are viewing their vote in positive terms. A 57% majority of Clinton supporters now consider their choice to be more a vote for her than a vote against Trump (41% say their vote is more a vote against him). The share of Clinton backers who see their decision as a vote in support of her has ticked up since the summer: In June, 52% of Clinton backers characterized their choice as being more for Clinton, while 45% saw it as a vote more against Trump. Among Trump supporters, about as many say their choice is a vote against Clinton (51%) as say it is for Trump (45%). There has been little movement in these views since the summer. Among Clinton supporters, younger voters are less likely than older voters to see their choice in positive terms. 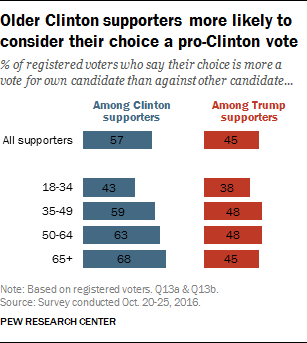 About six-in-ten Clinton voters ages 35 and older say they think of their choice more as a vote for Clinton than against Trump. By contrast, only 43% of Clinton supporters under 35 say this, while 56% view it more as a vote against Trump. Among Trump supporters, age differences in these views are less pronounced. The share of Trump backers who view their voting decision in a negative light is much greater than it was among supporters of most other candidates in recent presidential cycles. Just 45% of Trump supporters say they are mostly voting “for” him. In elections since 2000, clear majorities of the supporters of GOP candidates have considered their vote more in positive than negative terms. In the two most recent non-incumbent elections, 2000 and 2008, roughly two-thirds of those who supported George W. Bush and John McCain (64% each), respectively, said their choice was a vote in favor of their candidate. 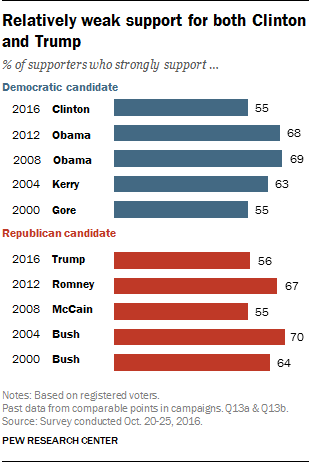 Among recent candidates of either party, only supporters of John Kerry in 2004 were more likely to view their choice as an anti-Bush vote (53% said this) than as a pro-Kerry vote. Hillary Clinton’s voters are less likely to view their votes in support of her than supporters of Barack Obama were in either 2008 (77%) or 2012 (73%), and somewhat less likely to say this than Al Gore’s backers were in the 2000 election (63%). Just over half of both Clinton (55%) and Trump backers (56%) say they strongly support their candidate. But levels of strong support were considerably higher among backers of both Obama (68%) and Romney (67%) in 2012, and for most major party candidates in elections dating back to 2000. The current low shares of backers who strongly support both Clinton and Trump are matched only by Gore’s supporters in 2000 and McCain’s in 2008. Both Obama and Bush, in both their first campaigns and their re-elections, garnered larger shares of strong support from their backers. How would Clinton compare to Obama, if elected? If Hillary Clinton is elected president, 56% of voters think she would be “about the same” as president as Barack Obama. About a third (34%) say Clinton would be a worse president than Obama, while 9% say she would be a better president. Two-thirds of Clinton supporters – 93% of whom approve of Obama’s job performance – think she would be about the same as Obama, if elected president. About as many Clinton supporters say she would be better (16%) as worse (14%) than Obama. Trump supporters are split on how Clinton would compare to Obama: 51% say she would be a worse president, while 47% say she would be about the same (just 3% say she would be better). Overall, 61% of women and 50% of men think Clinton would be about the same as Obama, if elected president. Men (41%) are more likely than women (27%) to say Clinton would be a worse president than Obama. Relatively few women (11%) or men (7%) think Clinton would make a better president than Obama, if she were elected. Among those ages 18-29, nearly as many say Clinton would be a worse president than Obama (46%) as say she would be about the same (49%). Among all older age cohorts, the share saying Clinton would be about the same as Obama far exceeds the share saying she would be worse. While relatively few Clinton supporters think she would make a worse president than Obama, men (21%) are somewhat more likely to say this than women (10%). And Clinton supporters younger than 50 are about twice as likely as those 50 and older to express this view (20% vs. 8%). Is Clinton’s gender a factor in campaign? Asked about the impact of Clinton’s gender on her treatment during the campaign, 51% of voters say that her gender has not been a factor in how she has been treated in the 2016 campaign; 30% say she is being held to a higher standard than past presidential candidates because she is a woman, while just 17% say she is being treated less critically than past presidential candidates because she is a woman. Half of Clinton supporters say she is being held to a higher standard because she is a woman; 42% say her gender isn’t a factor and just 7% say she is being treated less critically because she is a woman. Most Trump supporters (57%) say that Clinton’s gender is not a factor; 30% say she is being treated less critically than past presidents because she is a woman, while just 11% say she is being held to a higher standard. Overall, women (38%) are somewhat more likely than men (22%) to say Clinton is being held to a higher standard because she is a woman; 57% of men and 45% of women say her gender is not a factor. Among Clinton supporters, women (57%) are much more likely than men (40%) to say that Clinton is being held to a higher standard because of her gender. Among Trump supporters, somewhat more women (15%) than men (7%) think she is being held to a higher standard. With a few weeks left in the campaign, Clinton holds a 6-point lead over Trump among all registered voters: 46% of registered voters support Clinton versus 40% for Trump. Another 6% back Gary Johnson and 3% support Jill Stein. Note: This is based on all registered voters, not likely voters; estimates based on likely voters often differ from registered voters. As has been the case throughout the general election campaign, there are wide gender, race, age, education and religious divides in presidential vote preference. the important issues facing the country, it really matters who wins the 2016 presidential election. Just 19% say that things will be pretty much the same regardless of who is elected president. This is a rare point of consensus among Clinton and Trump voters. 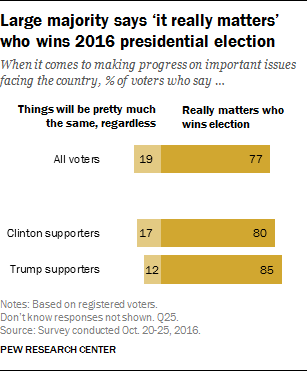 Wide majorities of both Trump (85%) and Clinton (80%) supporters say it really matters who wins the election. Voters say the outcome of this election really matters in terms of addressing key issues, but they draw distinctions about how much of a difference who is president makes across different areas. 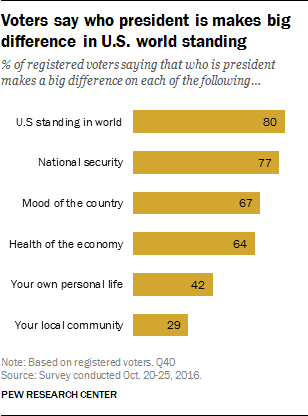 Large majorities of voters say that who is president makes a big difference on the standing of the United States in the world (80%) and national security (77%). Most also say the president makes a big difference on the mood of the country (67%) and the health of the economy (64%). However, closer to home, voters see a president as having a more limited impact. Overall, just 42% say that who is president makes a big difference in their own personal life, and even fewer (29%) say this makes a big difference in their local community.